It is a fairly small, stocky kestrel with a large, square head. It is 27-30 cm long with a wingspan of 61-68 cm and a weight of 167-246 grams. The female is about 4% larger and 10-20% heavier than the male. The plumage is mostly dark grey with a pale head and rump. The tail is grey with narrow black bars and a broad subterminal band. The underside of the flight feathers are also barred. 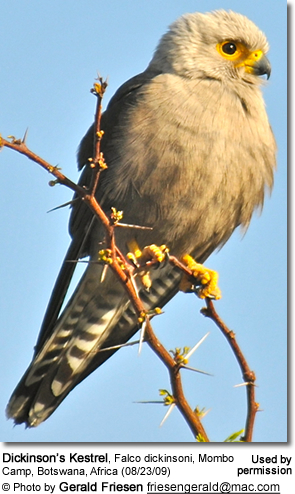 The cere (soft skin surrounding the nostrils) and feet are yellow and there is bare yellow skin around the eye. The bill is dark grey and the eyes are brown. Juvenile birds are grey-brown with barred flanks and without the paler head and rump. They have a greenish cere and eye-ring. 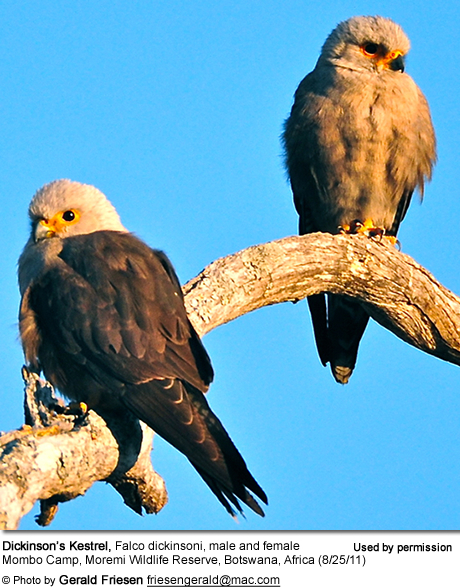 The breeding season lasts from July to October in Tanzania and September to December further south. The nest is a simple scrape with no material used. It is sited 2 to 18 metres above the ground in the crown of a dead palm or in a hole in a baobab. Sometimes the old nest of a Hamerkop is used. One to four eggs are laid. They are cream-colored with reddish-brown markings and are incubated by the female for at least 30 days. The young birds fledge after approximately 33 to 35 days.